I bet anyones last dollar we dont come close to a 63 on Tuesday,best forecast my foot,with all this snow around(which it will still be around on Tuesday,since temps will be just over freezing for the weekend)come Monday and Tuesday yes it will warm up to produce snow melt which will add moisture in the air thus will have a nice fog bank to burn Tuesday,temps stay in the 40's Tuesday. I believe it hit 60 on Tuesday. I'm just as surprised as you. Wunderground BestFirecast was indeed the best forecast. @Bill NWS already started to adjust downward for Thursday,now have a high of 43. Right now the euro and gfs are like night and day. the gfs wants spring to start while the euro gives much of the central part of country a huge arctic shot of air for late next week. at this point you would have to at least lean towards the euro solution (or at least a cooler one) given its recent track record. Does anyone else besides myself think that we will get more then just "a coating to a inch" tonight and thru the weekend,most everyone I heard keeps saying snowshowers for the next 2 1/2,and with colder temps in the 20's to near 30,I just have this feeling more snow will be laided down,if we get a couple frequent snow bursts....we'll see......as PWL says "bring it". Also a comment on the warmth I agreeing with the first two posts all that warmth that is forecasted by the GFS is whack,yes it will warm up a few days thru the 40's but I don't see anything higher then that,euro has the right idea after Wednesday. Weather.com down to 41 for Wednesday! 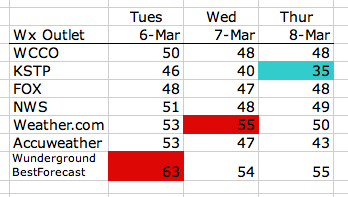 The warm-up for next week is way over-hyped. In fact, models are trending towards a colder than avg. week. However, TUESDAY will be warm. Ok I'll take a stab at this. Tues 60. Wednesday 45 but that will occur at midnight, afternoon high 38. Thursday 39. I've become overly sensitive to cold weather. 30 degrees for a high today with a little bit of wind and I was SUFFERING outside! I'd have done anything for a 30 degree day last winter. Interesting... the Duluth forcast for tonight was compleatly and utterly busted... They were expecting only an inch or two... but now they may need to issue winter storm warnings for this compleatly unexpected event. Geez, even though it is not affecting us, you guys ought to check out the duluth radar. The cirrculation keeps on strenthening, yet the NWS keeps the forecast to a minimum. I have to say, it is qutie unusual to have this happen. AREA. HAVE NOT SEEN A SWIRL LIKE THIS FOR MANY YEARS PERSONALLY. INDICATIONS OF A CONTINUED LAKE EFFECT/LAKE ENHANCEMENT SCENARIO. WILL WATCH VERY CAREFULLY FOR THE POTENTIAL FOR HIGHER AMOUNTS. @bemaki,any chance that "swirl" makes it down to our neck of the woods here in the metro,looking at radar it looks like the snow has made it as far south as Rice Lake and Hinckley....interesting indeed. @MW looks like the remants from the swirl is coming down I35,flurries/snow showers have worked into parts of anoka county,I could see them make it all the way down to the metro but it wont add up to too much,maybe a inch. Large busrt of snow up in Duluth... see if makes it down here. @bemaki....wish I was in Duluth right now,radar looks impressive!I don't think it will make it this far,it seems like the further you are from the lake it dissapates,doesn't go any further south then the Hinckely area,I guess that's why they call it lake effect,I guess were just going to have to be happy with our off and on snow showers today...got a solid half inch since last night here in golden valley,woo-hoo! It is still a very interesting feature to watch... and the thing is, they were not even expecting to issue an Advisory! Here's a little summary about what a "Lake Swirl" is. I've never heard of it, but find it pretty interesting. "Northwest winds over northern Minnesota and Northeast winds over Western Lake Superior caused the wind to converge. When it does this it has to go up, and by doing so cools the air parcel as it rises. This causes condensation and clouds and eventually snow. There was enough instability, with cold air aloft, to produce this significant snowfall. Also there's an inverted trough which also provides uplift in the upper levels of the atmosphere by creating a void that needs to be filled from below. So there's two reasons why we're seeing so much we have some localized snow because of these two features." I grabbed a still image from my GREarth program showing the surface features and wind barbs to illustrate that...cool stuff indeed! I can't remember the last time we ended up with lake-effect snow from lake Supurior. @bemaki, it happens quite a bit, but it's never much. Usually a brief "snow globe" snow like today. I'm surprised the advisories/warnings were canceled. It's still snowing up there and they're calling for several more inches overnight. You'd think 12+ inches of unexpected snow would raise a lot of havoc! Still snowing in and around the Duluth/Superior area,to add to your point AB they have added a lake effect warning/advisory for the area for most of today,with 2-7 more inches forecasted,LUCKY BASTARDS! @Novak,Randyinchamplin,Duane is that it for winter and snows?,I'm hearing people like Paul Huttner throwing out numbers like 50's and 60's into mid March as well as Paul Douglas throwing out a possible 70 degree high,I know this is not a typical winter,but usually were good for one or two tournment time snowstorms,yes,no,maybe.....what you say. Off topic here but how good are the SPC and NWS local offices getting at these tornado outbreaks? Can't remember the last big outbreak that the SPC wasn't on top of at least 4 days if not 7 or 8 in advance. If it DOES reach 70 degrees, we will probably see a large severe t-storm outbreak, and we will probably go back to normal. On the other hand. The GFS and the ECMWF are trying to pinpoint a retrograde low coming in from Texas. The GFS takes it straight up, reaching Iowa unitl it takes a right hand turn and over the great lakes. The ECMWF takes it over the front range, towards Colorade, and from that point the model run ends. It will be intersting to see how it shapes out. Thanks bemaki.....hopefully the warm stays away and we still get a dumping.......weather.com now showing snow for Wednesday,trend??? My gut is telling me we are done with the major winter storms (6+ inches) in southern MN (including the metro) and western WI. However, I know how crazy things can change around here with the changing of the seasons...but I personally think any of the events we get down here will be rain/thunder storms instead of snow. It honestly wouldn't shock me to see our first severe storms come early April, but that is more of a gut feeling. I have no evidence to back that one up. @ Duane, nice graphic on the the "lake swirl" snows. @ Big Daddy, Ive been looking at some of the teleconections out there and I really don't see much of a chance of a "plowable event" in our future, if you want the details, I will be glad to share my interpretation of what I think will happen. Thanks @Duane and @Randyinchamplin...I guess its time to flush the snowblower of gas and start tuning up the lawnmower....what a sad winter(22 inches)worst since I moved here in 1996. @Randyinchamplin what is the NWS talking about for Sunday in their latest discussion,talking about a cutoff low coming up from the southwest,I believe that was what bemaki was alluding to. I have a questions for all you weather fact experts.... How many 24 periods have had this winter below freezing? My best guess is about 5-6 at the most. It sure hasn't seemed like many at all. The most recent runs of the Euro have come around to the GFS's thinking of not digging the east coast trough nearly as much...which should mean we don't see as much of a push of colder air come the end of the week. Overall long range still looks warm with more rain than snow chances in there. That low will get cut off from the longwave trough that will will be coming across the area on Wednesday/Thursday. Where it goes from there is still too far out to be determined. It is pretty much just going to be waiting until another trough comes in and scoops it up. Until then, things look to stay fairly quiet for this neck of the woods. This week will certainly take a good chunk of whatever little snow pack we have. @mnmom2four, I took a peak at the airports data for highs and lows at MSP, and I counted 32 days that had sub freezing highs. Days that saw 32 for a high I did not count...only days of 31 and lower. I hope that helps. @MW yes there is a 500mb cut off low wandering around next weekend, the GFS takes it south and and then lifts it out to the NE, the Euro up around the Dakotas and than kicks it out NE over MN. We will just have to wait to see where it goes and how the surface will react to it. Right now it's not impressive at all. I should clarify on my previous post that I counted days from Dec 1 through Feb 29...aka meteorological winter. Mercifully this boring winter is coming to an end,50's and 60's,showers and thunderstorms all over the maps the next 2 weeks,sound the spring alarm and lay this winter to rest. 60° today??? underground best forecast says 61, Euro has been steady for days now on that, quickly cooling by the time you get to the north metro. We could see a 10-12° difference. It's hard to believe it can get reach 60 today with the snow on the ground but I suppose stranger things have happened. While I just have 2-3 inches of snow in my yard, it's very water-heavy and I can't see it all melting today. But, we'll see. 63 in Red Wing and Rochester, so here in Lake City it was somewhere in there as well. Time to think about what to plant in the garden. Bill, I would suggest a new post with a recap of all failed forecasts for thois winter, from the ridicolus 75 inches by Dave Dahl to the unlikely boldness by Ian Leonard in predicting far below average temps for Jan and Feb.
@Anonymous That's a good idea. Just need to find the time to go through the info and prepare such a wrap up. And as for winter being over, I'm still not convinced we won't get some snow later in March. People sometimes focus too much on the short-term. i think it was the 2007-08 winter (or 08-09) when we had 6+ inches of snow the last day of March, following a day with highs in the low 60s. Euro Temperature anomalies are positively through the roof next week. It shows 25+ avg. temps stretching from the Upper Midwest north the James Bay and much of eastern Canada for almost all of next week. This is too obvious to ignore. I wouldn't be surprised if much of the Upper Midwest including MN meet or exceed record highs starting this weekend through next weekend. That would be nearly a 7 day stretch of 20+ degrees above avg. highs. Sure, we may have a short bump in the road on SUN or MON, but this is absurd. and this from Dave Dahl's Blog " There's even a slight chance that a few of the storms late Friday could become strong or possibly even severe. It's very early to be talking about severe weather, but with the way the season has gone so far to our south, it's probably not too far off. @Bill the writing is on the wall,winter and snow is over,when DD is commenting about severe storms and not looking into his crystal ball and saying something with the mention of snow its a pretty done deal. I remember a 9.7-inch storm on April 29-30, 1984.... not saying that's going to happen but I'd bet the house money that we get at least 3 more inches of snow this year. what happens after the warm up of course is up in the air, but looking at those 850mb temps to the nw of us I wonder. Will they drop down??? seems likely to me, but who knows. Isn't this just appropriate for the '11/'12 winter season? Any other year, that storm pulling out of the SW on Sunday would dump heavy snow over MN. This year, no question, liquid. Where in the **** is the Arctic air? watching a great hockey game but I thought I would put this together while I'm watching it. How many records will fall next week??? The temps and year of occurrence are off the Minnesota Climatology Working Group site. Here are my thoughts on the percentages that the highs will fall.